Pregnancy is a rite of passage and the biggest transition a woman can experience. It can be a vulnerable time and a time of empowerment. When one becomes pregnant a change occurs, she notices pregnant women and babies everywhere. She feels her belly swelling with life and starts thinking of giving birth and preparing for the baby's arrival. A Mother Blessing is a platform that gives her support, love and wisdom. It's a celebration of motherhood, friendship and women. It's a gathering of intimate friends that come together to share love and wisdom in support of a mother to be. Create a beautiful day, that will make a mother to be feel beautiful, special and nurtured. This day can include prenatal yoga, a circle of wisdom, belly painting with the Painted Pixie, a Belly Photo shoot, a group felting project for the mother, and child and nutritious food. These rituals are implemented to evoke support and love towards the mother. The venue can be at someone's house, or at My Studio in the Woods, which provides a beautiful landscape for a gathering of women. 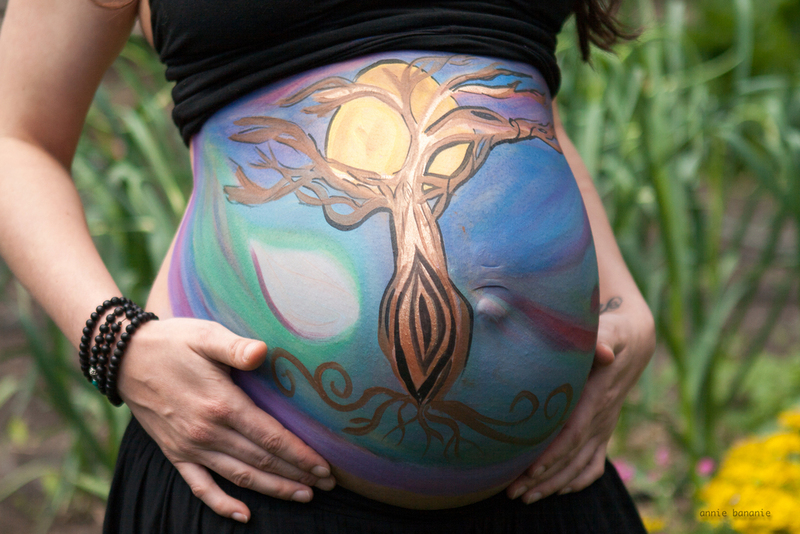 Belly painting is a fun way for the prenatal woman to set an intention for herself, her baby and this life transition. As the colours mix, meld and take shape the intention is set. The Painted Pixie is a professional face painter who loves to add mystic and beauty to pregnant bellies. She is magic herself and it is certain that any pregnant woman would benefit from her paints, smile and creativity. A Belly Photo Shoot is a perfect way to remember the internal growth of any pregnant woman. I love photography and make women feel comfortable while capturing her essence of beauty and her swelling of baby love. Prenatal yoga is a way for women to connect with their bodies and the life growing within. It teaches how to stay grounded within oneself, and how to breath effectively to help support through the birthing process and a tool that can be brought to everyday life. In our day of honouring we can participate in a yoga class. Movement, breath and dancing. A yoga class is a wonderful way to get centred and connect before creating the circle of wisdom. A Mother Blessing can be hosted in your home or at my Studio in the Woods, which is only 30 minutes from the city and provides a beautiful atmosphere of serenity, peace and love. With our hands and heart we come together to felt a gift for the baby. The options are many. We can needle felt a mobile, an animal that lives in a cave, or more. Another option is to wet felt a wall hanging for the nursery or a play mat that will be played with for years to come. These felted creations made by you will be special and cherished for years to come. Crafted in our Blessingway, we can honour a pregnant woman with a circle of wisdom. This circle can incorporate words of support, that uplift and inspire. This ritual helps her feel loved, nurtured and cared for. We can chant, sing, dance and share birth stories. There are numerous other rituals that can be done to help the mother to be feel special and honoured. Feel free to contact me and discuss the possibilities. It would not be a celebration without food. For our Mother Blessing a healthy, nutritious meal is prepared. This complies with the notion that foods are healing and support the growth of the mother and child. Food can either be provided by you, or we can arrange for it to be catered.